One of the most underrated places to visit in Seattle is the Smith Tower. Not only is it an historical landmark, but it offers fantastic, open air, 360° views of Seattle and surroundings. Visit an office building you say? Well, folks go to the Empire State Building as a destination. And this should be on everyone’s destination list when visiting Seattle. The views (as shown further down) are incredible. By modern standards this high-rise is puny, standing just 38 floors. However, it's much higher than the originally planned 14 floors. Burns Smith convinced his father, Lyman, to build higher. The goal was to steal the title of highest building west of the Mississippi from the National Realty Building in nearby Tacoma. To place this in context, Smith Tower was completed in 1914. The Smith Family is the known (in the U.S.) for Smith Typewriters and calculators. The beauty of the entrance hall highlights the age of this building. 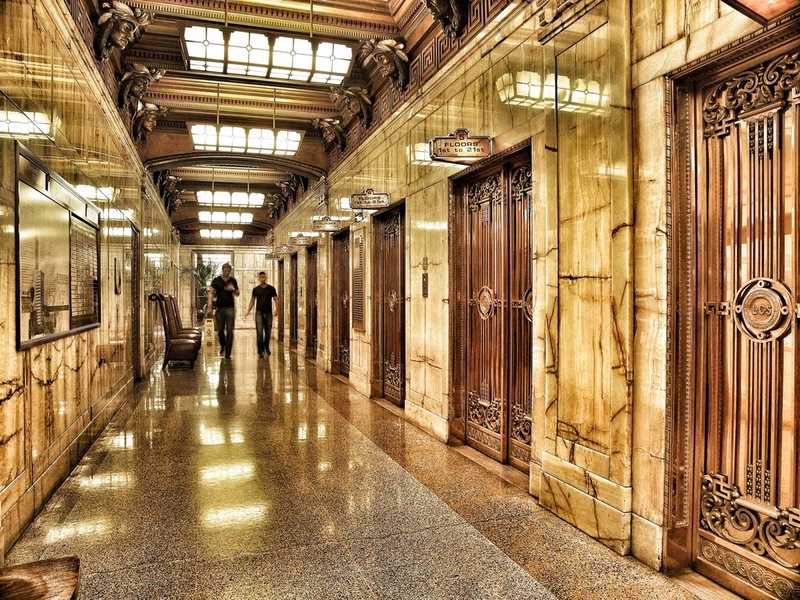 Brass elevator doors are juxtaposed against beautifully patterned marble walls. In a real throwback to decades past, The Smith Tower still employs elevator operators! And the doors are latticed; you see into each floor as you ride by on the way up. While the observation deck is completely enclosed with protective metal fencing, that fencing itself creates a stunning photographic venue.